I've written about trade-in values previously, but a recent experience drove home how scary it is for car buyers to get an accurate and fair dollar amount for their present car. CarMax is the largest retailer of used cars in the world. They also sell new cars in a few of their locations but used cars are their forte. As a Toyota dealer for 37 years, I routinely shop my competition as do most businesses. Last week I sent my mystery shopper to CarMax in Boynton Beach. He drove there in a 2004 Mazda6 and feigned an interest in buying a 2010 Mazda6 using his old car as a trade-in. The CarMax salesman, Paul, gave our shopper a price of $14,999. That was plus a $199 dealer fee, and a $12 markup on the electronic filing fee. In addition to that was the standard sales tax and tag and registration fee. The next step was to appraise our shopper’s 2004 Mazda6 trade-in. This process takes about 30 minutes and the appraisal was for $2,000. Now, CarMax is one of the few car dealerships that truly don’t haggle over price, neither the price of the car you’re buying or the car you’re trading. Some dealers advertise that they have fixed prices with no haggle, but they will haggle if you try. Our shopper tried to haggle, but to no avail. Here’s where it get interesting. More people buy used cars, sell used cars, and trade in used cars to CarMax than any other car dealer in the world. Because of their no-haggle, no-hassle one-price policy and very friendly and ethical reputation, they have grown to dominate used car sales worldwide. CarMax doesn’t have the lowest prices, but they have the highest trust of their customers. They even have a 5 day money back guarantee on the cars they sell…no questions asked. Other dealers advertise guarantees, but it’s always an “exchange” for another car, not your money back. We carefully appraised the 2004 Mazda6 before we visited CarMax. Three of our appraisers agreed that the wholesale market value was $3,000. One guide book, Kelly Blue Book valued it at $3,500. When I found out that CarMax had appraised it for one-third or $1,000 less than the true value, I was incredulous. I thought we might have made a mistake, but upon careful scrutiny I was reassured that the $3,000 value was accurate. One of my appraisers was a former appraiser for CarMax and I discussed this discrepancy with him at length. Here’s what I discovered. CarMax adjusts all of their appraisals downward by a factor dictated from their central corporate office. This factor is called the “Appraisal Cost Adjustment” or ADR and it is based on an algorithm or matrix which is determined by CarMax’s central office. The local CarMax appraiser appraises a customer’s car for the true market value and then subtracts the dollar amount dictated by the ADR. The bottom line is that our mystery shopper’s trade-in was reduced by about $1,000 to just two-thirds of its true wholesale market value. I say “about” because I don’t know what the CarMax exact appraisal was and I don’t know exactly what the CarMax ADR is. However, I can tell from looking at the 2012 fiscal year CarMax annual stockholder’s report that CarMax averages $953 wholesale profit on every used car they sell. This means that they pay their customers, on the average, $953 less than the true wholesale value. As a competitor to CarMax, this is amazing to me. Most car dealers actually lose money on the average wholesale cars they sell at auction. The goal of most dealers is to break even on wholesale profit or loss. The reason for this is that attempting to appraise a car below the true value can cause the dealer to lose the sale of the new car or used car they are retailing. This is simply because the dealers’ competitors will offer that customer higher trade-in allowances and win the business. In their last fiscal year CarMax made $300 million in profits on wholesaling cars that their customers traded in. Put another way, CarMax made “double profits” on their customers…a profit on the car they sold the customer and a profit on the car the customer traded in. Now remember, I’m not talking about making a retail profit on the customers’ trade-ins. This is something all dealers try to do, including me. I’m talking about making a wholesale profit on those trades that they couldn’t or wouldn’t retail. This kind of wholesale profit is unprecedented in the retail/wholesale auto industry. Now, please understand that car dealers will deliberately under-appraise a trade-in when they think they can “get away” with it. The common vernacular for this is “stealing the trade”. This occurs when a customer is so focused on getting a very low price on the new or used car they’re buying that they neglect to carefully consider their trade-in allowance. Also, trade-in allowances can be inflated beyond reality through the use of artificial markups on the new car via addendum labels, or, as I call them “phony Monroneys”. But, most car dealers average about $100 loss on every trade he wholesales vs. CarMax making an average of $953 profit. I can understand now why Warren Buffet bought stock in CarMax. Now don’t get me wrong, I’m not accusing CarMax of doing anything wrong. There’s absolutely nothing illegal or unethical about allowing a customer below market value for her trade-in…any more than it’s illegal or unethical to charge a higher price for the new or used car you retail than your competition does. CarMax does a lot of things better and smarter than most other car dealers which has allowed them to earn the trust of their customers. CarMax customers, not only trust them, but they look forward to a true haggle, hassle free buying experience. You combine all of that and it gives CarMax something called “pricing power”. Customers are willing to pay CarMax a higher price for the car they are purchasing and accept less for their trade-ins. However, my advice to CarMax customers is to “have your cake and eat it too”. Enjoy the haggle, hassle free and trusting environment of CarMax, but shop your trade-in with at least three other sources. You will likely be able to sell your car to another dealer of the same make as yours for more than CarMax will allow you. Had all of CarMax customers done that during the last year, they would have saved an average of $953 per car, totaling $300 million! For the benefit of new readers, the “dealer fee” is the dirty little secret of most Florida car dealers. It’s an extra charge ranging from about $400 to over $1,500 and averaging about $800 that the dealers surprise you with after you've been quoted a lower price. If you want to learn more about this rip off to the car-buyer, just Google “dealer fee” and “Earl Stewart”. Battling the dealer fee for years, I've often wondered why so many car dealers, sales managers, and sales people could go along with this unfair and deceptive sales practice. I truly believe that most people (including lawyers, politicians, and car dealers) are inherently good, honest people. I have to ask myself why an honest person would quote a price that he knows is a lot lower than the real one to a customer. I was watching CNBC and there was a discussion about the “Milgram Experiment”. This psychological experiment was conducted at Yale University by Professor Stanley Milgram. What motivated him to perform the experiment was to discover why millions of good Germans followed the orders of evil Nazi’s like Adolph Eichman while conducting the Holocaust during WWII. The experiment involved volunteers called “teachers” who questioned other people called “learners”. The teacher asked the learner to correctly match certain pairs of words. The teacher and learner could not see each other, separated by a partition. The experimenter instructed the teacher to push a button sending an electrical shock through the leaner for each incorrect answer. The initial voltage was very low and not enough to cause any discomfort. However, the experimenter told the teacher to increase the voltage with each successive wrong answer. The learner and the experimenter were in on the ruse, which was that no electricity was actually flowing. The machine was connected to an audio device which emitted recorded shouts of pain when the fake voltage reached higher levels…all the way to 450 volts. The amazing results were that 65% of the “teachers” went all the way to 450 volts, hearing screams of pain. They did this even though they believed their actions were causing intense pain and may also cause permanent bodily damage. Psychologists ascertained that there were two reasons for this. The first is called “the Agentic State Theory”. This is the “I was just following orders” reason as repeated often in the Nuremburg Trials. The essence of obedience consists in the fact that a person comes to view himself as the instrument for carrying out another person’s wishes, and he therefore no longer sees himself as responsible for his actions. The second reason psychologists believe accounted for this behavior is the “Theory of Conformism”. A person who has neither ability nor expertise to make decisions, especially in a crisis, will leave decision making to the group and its hierarchy. So there you have it. Car sales people follow the orders of their sales managers, who follow the orders of their general manager who follows the orders of the owner of the dealership. But why do the owners, the dealers, trick customers with the dealer fee? They aren’t following anybody’s orders. The car dealers fall under the “Theory of Conformism”. They feel that as long as everybody else is doing it, it must be OK for me to follow suit. A great local example of this started about two years ago when Ft. Pierce Nissan began charging a $799 dealer fee plus a $750 freight fee, totaling $1,549. Napleton Nissan in Riviera Beach picked up on this and matched Ft. Pierce by adding $750 freight to their current $795 dealer fee. Next, Royal Palm Nissan in Wellington followed suit. Then most Nissan dealers from Ft. Pierce to Riviera Beach add over $1,500 to the price you are quoted on a Nissan. Recently, I haven’t seen advertisements adding the double charge for freight to the dealer fee and I suspect the Attorney General’s office may have had something to do with this. Now you can understand why that smiling salesman can so guiltlessly throw the lever causing 450 volts of electricity to course through your body which is about the way most car buyers feel when they realized that they’ve been deceived. The salesman was “just following orders”. 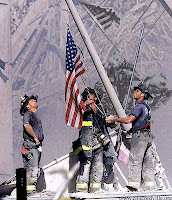 The flag honoring the First Responders of 9/11 will go up and it will be the tallest American flag in the World. I'm writing this from my hotel room in New York City where I had lunch on Tuesday, June 5 with Mayor Rudy Giuliani. We discussed the First Responders of 9/11, he is totally supportive of the flag, and I will invite him to speak at the flag-raising. The flag might not go up in Lake Park, FL but it will go up somewhere nearby and soon. I will give the town commission of Lake Park one more chance to understand what this flag will mean to Americans and the World, but I'm confident that other local municipalities would be honored to be the home of such a tribute to our First Responders who willingly gave their lives to save other Americans. I firmly believe that a majority of Lake Park residents want the flag to be in their community. As happens all too often, the vocal few are mistaken for the silent majority and these “professional naysayers” got the ear of the Lake Park town commission. I have spoken with elected officials in other towns and cities in Palm Beach and Martin County who are very positive about being the home of this memorial flag. Although I would l prefer to keep the flag in Lake Park where my business has been for 37 years, I will change the location if I have to. Lake Park borders North Palm Beach, Palm Beach Gardens, Riviera Beach and Palm Beach County. In fact, Martin County is just a few miles north, bordering Jupiter and Tequesta which Jupiter Inlet Colony borders and is where I live. The flag will be so tall (I've decided to make it 343 feet tall rather than 341 because 343 is the exact number of firefighters who died at 9/11) that whether or not it's in one municipality or another, it will be visible to all for many miles. The objections that have been raised against this flag are not surprising. I've been told all my life that I can't do things but I do them anyway and successfully. People laughed when I told them I would become the largest volume car dealer in Palm Beach County because my dealership is in the tiny town of Lake Park, population about 9,000. I was told that I would never dare put red phones all around my company so that any customer can call me personally anytime. They said the same thing about giving my home telephone and cell phone numbers to all of my customers. They told me that if I did a TV commercial in Spanish, it would tarnish my reputation and hurt my business but my business thrived. It's always interested me how my ideas are attacked. When I made the Hispanic TV commercial, I was attacked from the far right and defended by the far left. With the flag, I'm attacked from the far left and defended by the far right. The extreme left and right are always the most vocal and visible. What neither "far side" understands or cares about is the vast silent majority who, in the long run, determine the direction in which we move. The silent majority hears and sees what the left and right are making all the noise about, but they are too busy going about their daily lives, raising kids, going to work, and enjoying life to immediately "jump into the fray". However, they are not too busy to get involved when they have to. They usually vote the best candidates into office and they vote with their pocketbooks when they buy products and services. If I had to tell you one thing that has been responsible for my success it's that I think like a member of the silent minority but I've not always been silent. Maybe I should think of myself as a "spokesman" for the silent majority. When the flag honoring the 9/11 First Responders is raised soon in one of our local communities, I and the silent majority will prevail as we usually do and the ranting of the fringes will be long forgotten. Florida, Palm Beach County (or Martin) and a local town will be known as the home of the World's tallest American flag and a memorial to the First Responders of 9/11. The vast silent majority will benefit all economically and righteously even the fringes who always protest progress. Why Do Some Reporters and Editors Deliberately Misreport the News? I am writing you in hopes of getting your support on what I feel is the most important and meaningful endeavor I have ever undertaken. 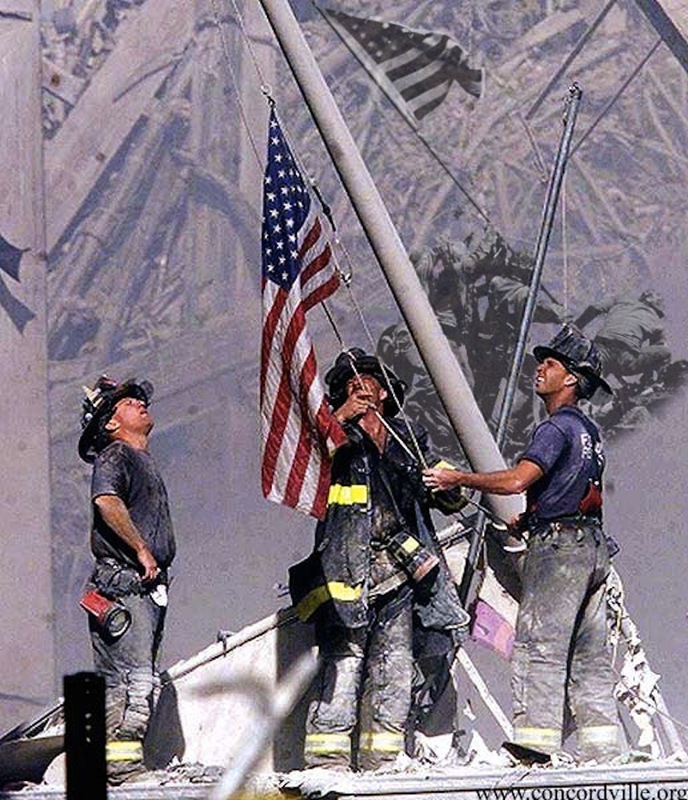 As America winds down a decade of war, I cannot help but feel there is something we should do as a community to honor the sacrifices made by our soldiers and by the first responders of 9/11. I am proposing to erect a monument in our town that will serve this purpose. I intend to install the tallest flag pole in the United States of America and fly what will be the tallest American flag in the entire world on top of it, here, in Lake Park, Florida. I will assume 100% of the cost of its construction, installation, and continued maintenance. The pole will be constructed by a licensed and bonded company that specializes in flag poles of this scale and it will be installed by a local contractor. Once complete, the height will reach three hundred and forty-one feet and will fly an American flag that is sixty feet by thirty feet. This flag will benefit our town in numerous ways, among which is the draw it will have on visitors to south Florida: it will have very positive impact on local tourism. It will serve as a source of pride in our community, particularly among each of us who were so profoundly affected by the attacks of 9/11 and who call Lake Park their home. Once installed, I will arrange a dedication ceremony and the monument will be dedicated to the living and fallen first responders of 9/11. This will be tastefully done, as will the continued display of the flag – without the taint of commercialism or hype. I am asking for your support because I believe this requires people with a vision of the possible to not think that this is “crazy.” I’m used to being called crazy, but I know that credit for my successes in life and business goes to my craziest ideas. I am asking you to believe in this crazy idea. I am asking for a leap of faith. You can read the PB Post article by clicking on this link, www.PBPostFlagArticle.com. I will also post the article in its entirety at the bottom of this blog post. The headline has changed because I strongly protested it to the PB Post, but it’s already run in last Sunday’s paper and the text of the article remains slanted and inaccurate. I was disappointed because what DiPaulo reported was not what I told him. After reading my letter above to the Lake Park town commission, you can see there’s no resemblance between that and DiPaolo’s article. My main motivation for erecting this flag is to honor the fallen heroes of 911 and to bring attention to this flag which will be the tallest American flag on the Earth. By bringing attention to the world’s tallest American flag, awareness will also be brought to the USA, Florida, Palm Beach County, the town of Lake Park but most importantly the 422 first responders who died. Yes, of course, it will also bring recognition to me because the flag was my idea, it’s on my property and I paid for it. But to write and headline the article that a “Car dealer seeks towering legacy in flagpole” is maliciously false and libelous. Florida, Palm Beach County, and Lake Park all will benefit by those who travel to our community to see and take pictures of the World’s tallest American flag which is dedicated to honor our fallen 911 heroes. I did say to DiPaolo that “I would be less than honest if I did not admit that having the world’s tallest American flag flying above my property would bring awareness to me and my business too’. I did not think that he would take that honest admission and make it the focal point of the “news” story. Isn’t it interesting that nowhere in the article does DiPaolo mention the American flag, only the flagpole? In fact, this is not the tallest flagpole in the world, there are taller flagpoles flying the flags of other countries. I specifically told him that and suggested that he Google tallest flags and flagpoles. He said that he would. He also makes only a slight, passing mention of the fact that I’m dedicating the American flag to the fallen heroes of 911. DiPaulo also brought up the long forgotten feud that I once had with one of the Lake Park town councils many years ago. This had to do with the ire of a very few Lake Park residents and councilman who resented my using the name of North Palm Beach in my marketing. I believe DiPaulo supported that view at that time and decided to resurrect the argument for this article…presumably in an attempt to defeat my request for permission to erect this American flag. I believe that DiPaolo’s comparing this flag to Donald Trump’s flagpole was a deliberate attempt to make what I’m attempting to do appear to be an ego enhancing marketing stunt which “the Donald” is famous for. I’ve been interviewed by the press and other media hundreds of times over the years including national and local and most often by the Palm Beach Post. Ninety-nine percent of the time I’m quoted accurately and the story is written honestly. Interestingly, recently there was another false article written about one of my employees by a Palm Beach Post reporter when the reporter falsely attributed my service manager’s favorite quotation to “Malcolm X”, the infamous racist. The editor of both stories was Nick Moschella…sheer coincidence? I demanded an apology from Moschella then and I never received one. I won’t waste my time asking for one again. You can read the article I wrote about this, “Never Having to Say You’re Sorry if you’re the PB Post”. 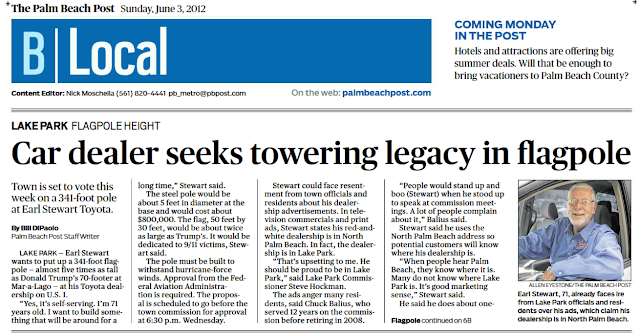 LAKE PARK — Earl Stewart wants to put up a 341-foot flagpole - almost five times as tall as Donald Trump's 70-footer at Mar-a-Lago - at his Toyota dealership on U.S. 1. "Yes, it's self-serving. I'm 71 years old. I want to build something that will be around for a long time," Stewart said. The steel pole would be about 5 feet in diameter at the base and would cost about $800,000. The flag, 50 feet by 30 feet, would be about twice as large as Trump's. It would be dedicated to 9/ 11 victims, Stewart said. The pole must be built to withstand hurricane-force winds. Approval from the Federal Aviation Administration is required. The proposal is scheduled to go before the town commission for approval at 6:30 p.m. Wednesday . Stewart could face resentment from town officials and residents about his dealership advertisements. In television commercials and print ads, Stewart states his red-and-white dealership is in North Palm Beach. In fact, the dealership is in Lake Park. "That's upsetting to me. He should be proud to be in Lake Park," said Lake Park Commissioner Steve Hockman. The ads anger many residents, said Chuck Balius, who served 12 years on the commission before retiring in 2008. "People would stand up and boo (Stewart) when he stood up to speak at commission meetings. A lot of people complain about it," Balius said. Stewart said he uses the North Palm Beach address so potential customers will know where his dealership is. "When people hear Palm Beach, they know where it is. Many do not know where Lake Park is. It's good marketing sense," Stewart said. He said he does about one-third of his sales on the Internet. The dealership sells about 400 used and new vehicles a month and employs 146 full-time workers, he said. 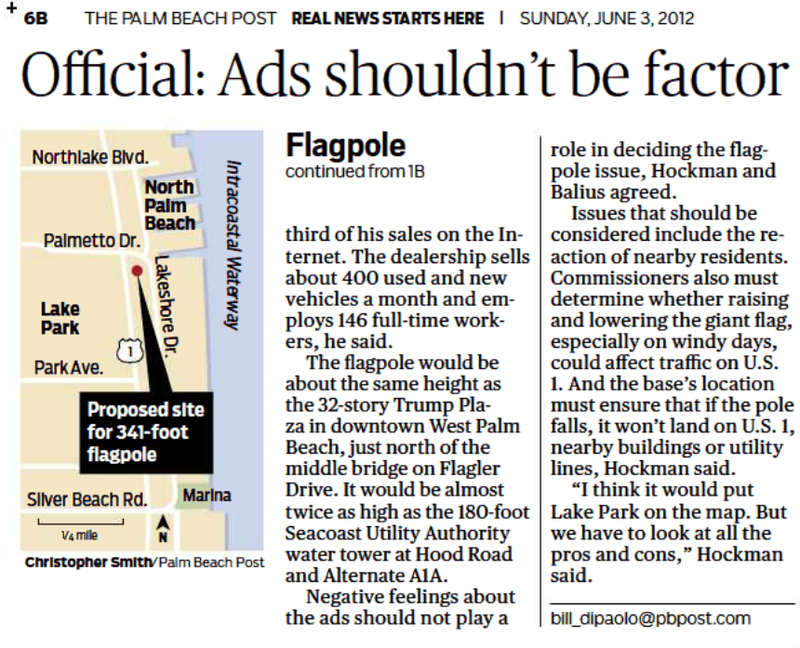 The flagpole would be about the same height as the 32-story Trump Plaza in downtown West Palm Beach, just north of the middle bridge on Flagler Drive. It would be almost twice as high as the 180-foot Seacoast Utility Authority water tower at Hood Road and Alternate A1A. Negative feelings about the ads should not play a role in deciding the flagpole issue, Hockman and Balius agreed. Issues that should be considered include the reaction of nearby residents. Commissioners also must determine whether raising and lowering the giant flag, especially on windy days, could affect traffic on U.S. 1. And the base's location must ensure that if the pole falls, it won't land on U.S. 1, nearby buildings or utility lines, Hockman said. "I think it would put Lake Park on the map. But we have to look at all the pros and cons," Hockman said.